What is Hidan's Source of Power? Hidan is probably the most misunderstood character in Naruto. He has the ability to survive pretty much anything (including decapitation), and is able to remote-injure opponents whose blood he tasted, and while he's inside his cursed circle. Where did this power come from? What kind of technique is that? Every single technique used in Naruto so far has been explained to some degree, besides this one. Do anyone has some information to shed light on the technique? From the Data Book perhaps? The Way of Jashin uses bodies of believers in forbidden jutsu rituals. Hidan was the first successful test case. 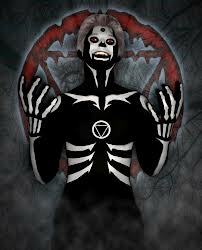 As a reward for his many massacres, Hidan acquires an immortal body via the Way of Jashin. This only helps to affirm his love for the Way. The Way of Jashin is absolute for Hidan, the only thing worth believing in. He considers his supreme purpose to be to spread the Way of Jashin to nonbelievers throughout the world. It means to create a world that acknowledges mass killing. And Hidan feels that this is possible by being a part of the Akatsuki. And this is about it, regarding to info on Hidan on the databook. Can the Tailed Beasts' relative power levels be compared? What political power does a Kage have? What is the new shuriken formed from Naruto and Sasuke's power? What Mangekyo Sharingan power does Itachi have? What is the power of Rinnegan? What was the source of inspiration behind the character Sasuke in Naruto? Why doesn't Naruto have/use his Six Paths power? How long does a Hokage stay in power? What happened to the power of the tailed beast that was inside Naruto?